Box Set Heaven — And a #Giveaway! One of the things I love about this time of year as a reader is All. The. Box. Sets! Most recently, we heard about Frosting and Flurries. And we’ll hear more about that one next week as well, as I’ve got one of the authors coming by for a little interview. Then there was Sweet Christmas Kisses 3 that has 17 (17!!!!) books in it. And An Aussie Summer Christmas with lovely stories all set down under, where Christmas happens mid-summer instead of in the throes of winter. And also Candy Cane Kisses with 8 novellas. That’s all I see on our Books page, but it feels like there might be one more I’ve read about here recently. Leave a comment letting me know which one of these listed sounds the most interesting to you and you might just win it. I’ll choose a winner on Saturday evening. I am not crazy about novellas for the most part but box sets with full length books? Those are great! And the first books of series for it sounds even better sound I like them I can get more. Cassandra, before I started writing, I was just like you with regard to novellas. But yes, all those series starters! It’s yummy. I have Candy Cane Kisses and Frosting and Flurries. I’ve actually been reading from both of them (random books) based on what I’m in the mood to read. I like the mysteries from Candy Cane Kisses, but I didn’t start there. I’ve read two romance novels before and realized one of them had a sequel in Frosting and Flurries, so I jumped there and went on to read another one. Sometimes I forget if I’ve finished a boxed set, because I rarely read the books in orders, but I do love getting them. I have all the other boxed sets you’ve mentioned in my wish list. Some of them have books I’ve read before, but they are all books I like, so I might considered them just to read the other ones…An Aussie Summer Christmas is definitely not in that category, so it is way up on my list. I have Candy Cane kisses and Fristing and Flurries. I am sure they will be really good reading when I am on winter break. I bought Falling for You yesterday and I have Candy Cane Kisses. Frosting and Flurries might be a good one to add to my collection. I just finished Frosting and Flurries this week. It’s delightful. I have all of the ones you mentioned, Elizabeth. Now, I’m pushing through NaNoWriMo so I can get some good reading in during the month of December. My Christmas gift to me..yay! I read and enjoyed Falling For You when it came out. I’m reading Frosting and Flurries now. I also enjoyed the Aussie Summer Christmas. I haven’t gotten the Candy Cane Kisses or the one with 17 novellas, or We’ve Only Just Begun. I think I would enjoy any of them, I just like to read! I would probably choose Sweet Christmas Kisses 3 next. Thanks for writing! I love the boxed sets with the novellas. I haven’t read any of those yet but they all look great. I would love to win any of them. Yay! I’m so glad there are some potential new reads here for you. I love finding new authors and series this way too. I read Falling For You as an ARC, and it was fantastic! I’d love to read the others too, especially the Aussie Summer Christmas as I have Australian friends and would really enjoy reading about a down under Christmas! The Aussie one is next for me, too. I love boxed sets! The one that sounds interesting to me, is We’ve Only Just Begun! Love that they are the beginning of a series. That way there will be more stories to read! I would pick The Texas Ranger’s Proposal or Christmas in Montana series. If they are not Historical Fiction, they will be western! My favorites now days. I love The Lone Star Cowboy League books and the Cowboy Creek series and Appalachian Matches series. JoAnn – I’m so sorry I missed that box, I didn’t see it on the books page (have you told Valerie about it?) But there are some great books out there in boxes this season! I’m glad you mentioned it! I began reading boxed sets when they first became popular in 2013 and enjoyed the diversity of the stories and authors. Ever fall there seems to be an abundance of release. My last count was over 80 novellas. Almost killed my love for reading. In the past, I would read from beginning to end. Now I start with my favorite authors. Boxed sets are also having more stories. I prefer sets to be less than 10 novellas or stories. That is still a bargain price for 99 cents. 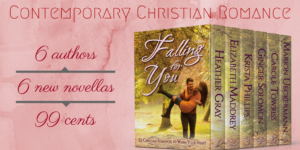 I enjoyed Falling For You – fun set of fall themed romances. Then I read An Aussie Summer Christmas – enjoyed learning about Australian Christmas traditions. Never finished all the stories in Sweet Christmas Kisses 3 – 17 stories a bit much / even though I enjoyed the boxed sets Sweet Christmas Kisses 1 & 2. I also enjoyed Candy Cane Kisses. 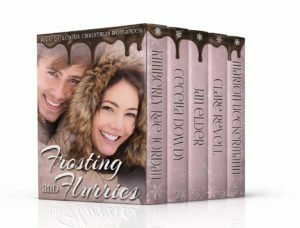 My favorite boxed set this year was the boxed set Frosting and Flurries – sweet romance reads with a holiday recipe. Just boxed sets are becoming more popular and more available – each set now needs a new twist, for example the Australia theme and the Holiday Recipe theme. The only boxed set I have not bought or read is We’ve Only Just Begun. Happy Writing! I’m going to try this again. Heather Gray and I are in a box set called Christmas Blessings this holiday season (as well as a couple of former Inspy Romance authors). Readers have a lot of choices for their reading this Christmas, and more than ever before. Congrats on the sets you’ve involved in, Elizabeth. Blessings! I love Falling For You! I would love to read any of the other sets. Yay! Thanks for coming by. They both sound great but “The Frosting and Flurries” title caught my eye. It’s a great title, isn’t it? And a very fun set. Either Frosting and Flurries or Candy Cane Kisses, they both sound good for the upcoming holidays. Can you believe it’s almost that time again?? I really, really can’t believe we’re 2 weeks out from Thanksgiving. Frosting and Flurries is the set I’m most looking forward to reading!